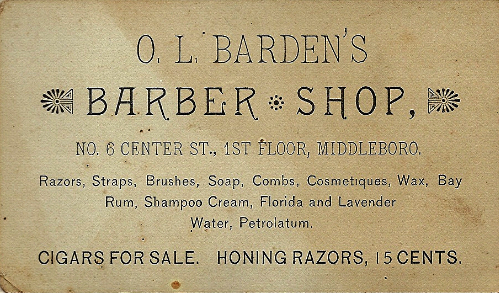 Otis L. Barden (1849-1934) was a well-known barber in Middleborough for over 60 years. Barden initially learned the barbering trade in the shop of Solomon H. Sylvester on Center Street beginning at the age of 16. Eventually Barden established his own shop which existed in a number of locations about Middleborough Four Corners during the late 19th and early 20th centuries. One of Barden's earliest shops "stood where the Bank Building is now located [and] was the forum in the days of old, where the momentous questions of the day were discussed." 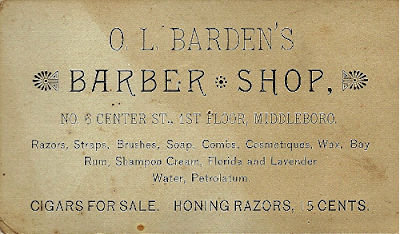 Barden catered to both sexes as indicated by an advertisement from 1905: "O. L. Barden, Ladies', Gents' and Children's Hair Cutting and Shampooing. Also Facial, Scalp and Body Massage Treatment at your own home. Drop a postal or call at my shop. Centre street, Middleboro." To assist him in his business, Barden hired other barbers including M. E. Hoey of Sandwich in 1904 and Frederick Bowe (who was described as a "tonsorial artist") in 1905. Barden was also affiliated with the local barbers' union which established regulations for its members, including opening and closing times. Barden continued cutting hair until the last year of his life. At the time of his 77th birthday in 1926, he was believed to be the oldest barber operating in Plymouth County "and is surely the oldest man doing business in Middleboro, in point of years.... He still conducts a shop on Centre street, catering to a class of trade he has had for years, and age has certainly not deprived him of his dexterity in his chosen calling." Barden died in June, 1934, at the age of 84.